The Mediterranean food chain had semi-good surprise news for investors. After a couple of years of same-store sales declines, the restaurant industry has been able to stop some of the bleeding so far this year. Falling foot traffic continues to be a problem, but many chains have been able to offset modest traffic declines with slightly higher menu prices. 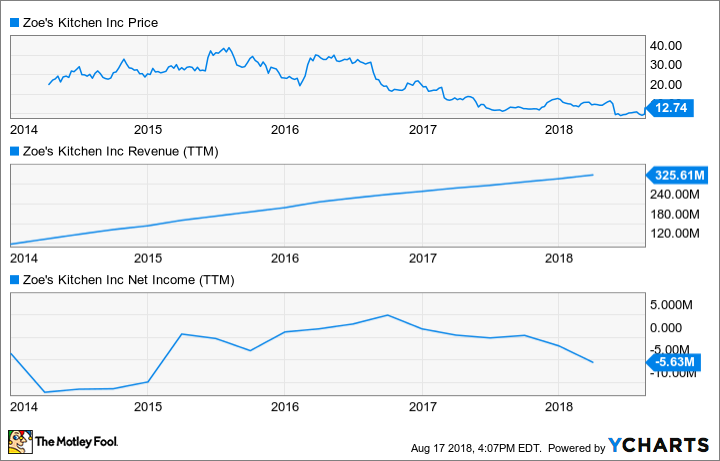 There has been no such luck at fast casual Mediterranean chain Zoe's Kitchen (NYSE:ZOES) -- at least as of the first quarter of 2018. Zoe's was scheduled to report its earnings for the second quarter of 2018 on August 16. However, it pushed back the earnings release by a day without explanation. Then, instead of releasing the report on the morning of the 17th, the restaurant chain announced it was being taken private. Zoe's has entered a definitive agreement to be acquired by the privately-held Cava Group. Zoe's and its 261 locations across 20 states will combine with Cava's 66 Mediterranean-themed "chef-casual" restaurants (a fast-casual restaurant that uses a menu created by a fine-dining chef). Cava also has a line of dips and spreads it sells at Whole Foods stores. As for Zoe's investors, the offer is for $12.75 a share in cash. That values the chain at about $300 million. If a majority of investors vote in favor of the offer, the two companies expect the deal will close in the fourth quarter of this year. Since Cava is a significantly smaller chain than Zoe's Kitchen, it went out and secured funding through an equity stake from private investment firm Act III Holdings. This buyout offer appears to end a short but troubled chapter for Zoe's as a public company. The stock debuted in the spring of 2014 at $15, valuing the company at about $276 million. Shares raced higher, peaking at over $40 a year later before slowly deteriorating ever since. Revenue hasn't been the problem. Sales have steadily increased as the company has expanded its store base. The problem, though, is that foot traffic and sales have declined at existing locations. It wasn't all Zoe's fault, as restaurant industry overexpansion began to cannibalize traffic starting a few years ago. However, the broader industry trend has begun to stabilize, whereas comp sales trends at Zoe's have remained negative. Zoe's Kitchen stock closed at $9.52 prior to the offer, so $12.75 is a welcome 34% reprieve from the multiyear slide. However, for anyone who bought in prior to the first-quarter 2018 report back in May -- when shares traded hands for about $16 -- the price tag is likely underwhelming. However, this could be as good as it gets for Zoe's for some time. Management said the company will release its second-quarter results -- sans earnings call -- by August 20, so investors will at least get the chance to look for signs of improvement in the business fundamentals before casting votes on the buyout. That could be significant, as Zoe's can seek and entertain other offers for 35 days. If a higher bid comes in, an $8.5 million termination fee would be payable to Cava. Either way, though, it looks like long-term public shareholders will be shut out from sharing in Zoe's future -- whether for better or worse.